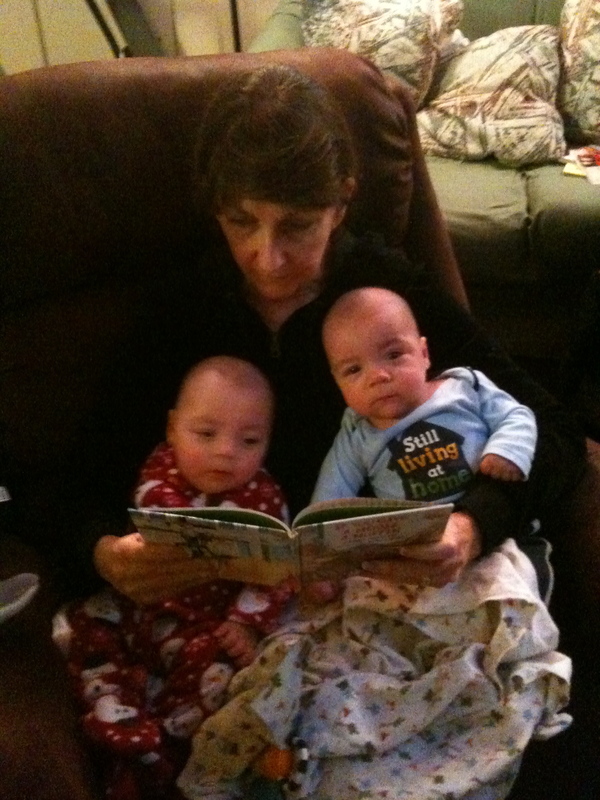 When GrammaJ came to visit us this weekend, she looked at our squirmy little muppets and exclaimed how big they are getting. Before we know it, we’ll be closing out the year. This weekend we kicked off the holidays. On Friday, Jon and Uncle Jeffrey trekked up to the Santa Cruz mountains to cut down a fresh Christmas tree. 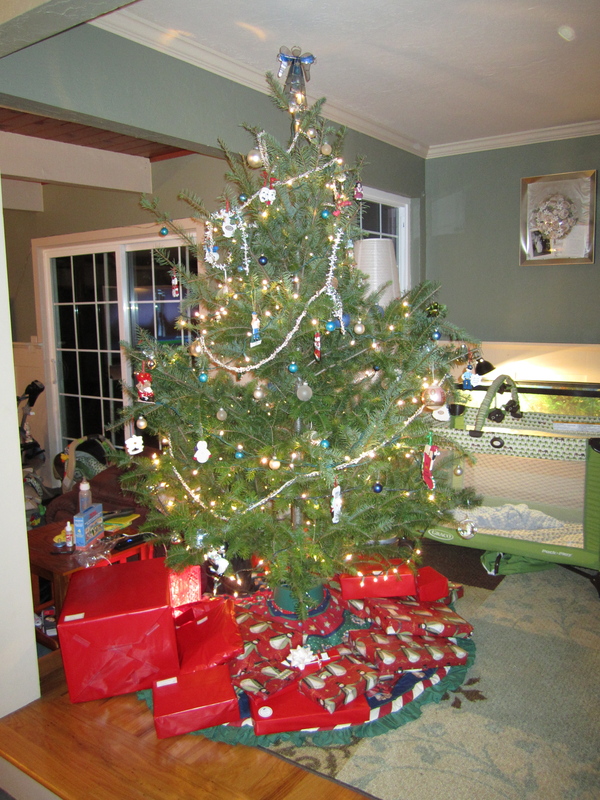 We’ve always had a fake tree before, so this was our first step toward going all out for the muppets first Yuletide. “That was a lot more difficult than I expected!” Jon announced upon their return. I think the expectation was that it would be similar to a tree lot. Instead, there was a hill. With trees. “Can I help you?” the guy in the booth asked them. “You have any trees?” Jon replied deadpan? The guy in the booth gestured out to the hill. “We’ve got those.” He handed them a chainsaw and returned to his business. They wandered the hillside looking for the perfect tree. Although Jon seemed a bit concerned that the winning selection wasn’t as perfect as its plastic predecessor, I am extremely impressed with the one they found. (Charlie Brown, eat your heart out…) Our living room smells amazing! I’d forgotten how awesome it is to walk into a room and be engulfed in the spirit of Christmas (also known as the scent of a Douglas Fir tree). Tangent: I smell every candle I can find that claims to be that mix of Christmas tree and spiced pinecones. I have yet to find one that comes close to the real thing, so for Christmas’ past, I’d simply liberate fallen branches from the trees sold in front of grocery stores. After I finished baking a spiced pumpkin roll and Yule Log, (I know, I used my kitchen! These are holiday traditions that must be had – even if the muppets are too young to enjoy them first hand.) we decked the tree. The soft white lights brighten the room and transform the shrubbery from mere foliage to a true holiday symbol. Interestingly, it’s a lot more difficult to hang ornaments on a real tree. The branches are far flimsier. Growing up, Santa left my brother and me an ornament every Christmas. So every year, decorating for the year-end holidays becomes a nostalgic trip down memory lane. I certainly don’t deny that the winter holidays have always been my favorite time of year. But adding to my frenzied preparations is the hope of starting new traditions with my new family. I remember waking up with my brother every half hour. “Mom! Is it Christmas yet?” I remember Paul and I running to the tree on Christmas morning while Mom and Dad ran equally excited toward the coffee maker. We’d spend the afternoons with family and friends, culminating in a big celebratory dinner. I want this time of year to be as exciting for Search and Destroy as they grow up, so they can write a similar blog post when they’re great big adults reminiscing about their childhood as they hang years of ornaments celebrating and reminding them of a happy childhood. The muppets have certainly been good this year; I can only assume they are exceedingly high on Santa’s “nice” list. Nothing can equal childhood memories of Christmas — they are precious. And Search and Destroy will have your wonderful Blog to remind them. It’s true that ornaments are harder to hang on a “real” tree — I don’t know about tradition but I have great stories about some of our Christmas trees. G.G.